Very Very Vicky: Last But Not Least! 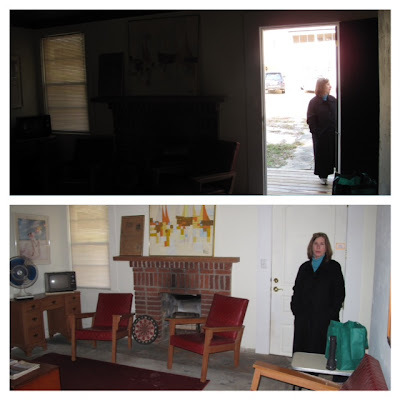 It is time to tell the story of the last room at the Coral Cottage--last but not least. The living room is the first room you see when you walk into the house. Henry caught my first glimpse of The Coral Cottage as I walked into the living room. Take it all in with me as we see the room from all angles. Standing in the hall between the two bedrooms and looking back toward the room. So there you have it--the Coral Cottage BEFORE! What would you do? What would you keep and what would you dispose of? These were all questions that crossed my mind. This week I will show you what we did. maybe possibly the chairs and loveseat? They look very retro. Can't wait to see the final. I kept most of this stuff except the sofa. Some of it I have used at another cottage. I'll show you in the weeks ahead.